Over the last few years, we’ve slowly upgraded our kitchen with new black/stainless appliances. Unfortunately, the only appliance left standing was the lonely white refrigerator. It keeps things cold so why get rid of it just because it doesn’t match the other appliances? Instead of throwing it to the curb or selling it, I gave it a fun facelift using homemade black chalk paint and ChalkOla Chalk Markers. *This post contains ChalkOla product links. I was given both sets of chalk markers for my review. My opinion is 100% mine. The lonely white refrigerator needed a little preparation. First, I cleaned the outside of the refrigerator using a degreaser. Then, using my palm sander, I lightly sanded the outside surface. After wiping down the refrigerator, I mixed up a batch of chalk paint using black paint and Plaster of Paris. Using a small roller, I applied the chalk paint evenly. I skipped the area around the refrigerator door seals because I was worried about the door sealing properly after the paint dried. I’ve seen others use a spray-on chalk paint to that area but not the roll on paint. I wasn’t willing to take the chance and decided to play it safe. After allowing the paint to dry overnight, I prepared the newly painted chalkboard surface by covering the surface with plain chalk then wiped it off. It’s best to place the chalk on its side and glide the chalk over the surface to cover the entire area you wish to use. You must prepare the chalk paint for the chalk. Do not skip this step. If you write on the chalkboard paint without preparing the surface first, it will be difficult to remove chalk or chalk marker. You will also be left with a ghost image of your artwork. You will also need to prepare the chalkboard surface after using a cleaner or water on the chalkboard. Always prepare surface after each cleaning. 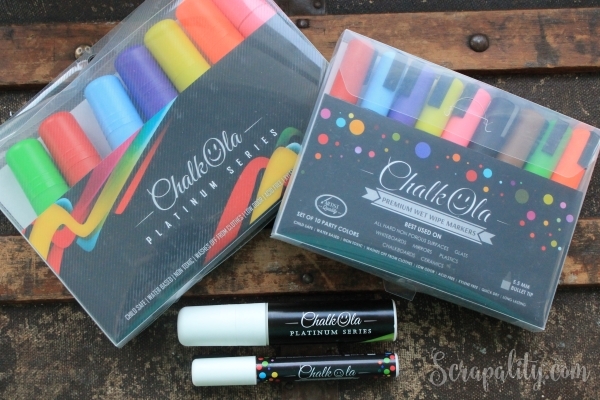 Why should you purchase the ChalkOla Markers? ChalkOla Premium Wet Wipe Markers are best used on NonPorous surfaces like chalkboard, whiteboards, mirrors, plastic, glass and ceramics. The set contains 10 party colors with a 5.5mm bullet tip that makes them easy to write or draw an image. They’re quick drying, child-safe, non-toxic and washes out of clothes. They ‘re perfect to keep your kids or not so little kids busy for hours. Unlike chalk, they’re not messy. You won’t be left with a crazy chalky mess on the floor. Ask, me how I feel about sweeping the floor and mopping the floor after using chalk. It wasn’t the highlight of my day I assure you. Check out the tip on the Platinum Series, it’s huge! ChalkOla also carries the Platinum Series of 8 different colors with a 15mm tip. The Platinum Series is great for drawing super thick lines for calendars or dividers. 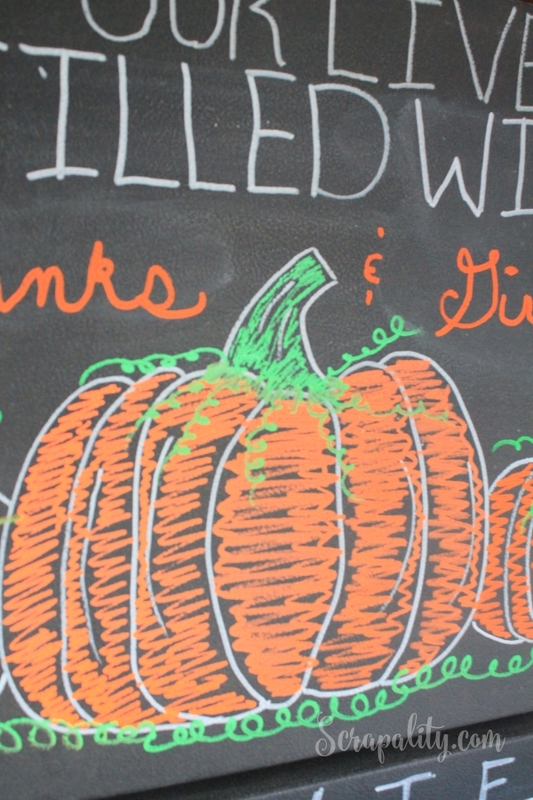 After deciding on a Thanksgiving saying and image for my new chalkboard refrigerator, I used the ChalkOla Premium Markers to write the saying and draw the pumpkins. I love how the colors pop against the black chalkboard paint. They’re even bright in dimmer lighting. Vibrant color, that stays true! They don’t mud or mix together when applying one color on top of another color. 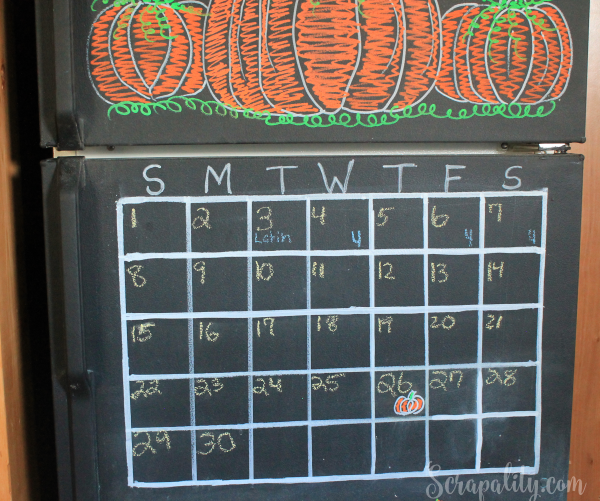 Below the pumpkins I added a family calendar for my girls to add after school activities and appointments. The thick lines were drawn using the white Platinum Series Markers. The lines are solid and bold. Unlike the lines, the numbers were written using regular chalk. They are bumpy and not as bright. See the difference? Why use regular chalk for the numbers? When November is over I can easily wipe away the numbers without disturbing the calendar. Then, I can easily add December’s numbers in the appropriate squares and my calendar is ready to go for the new month. 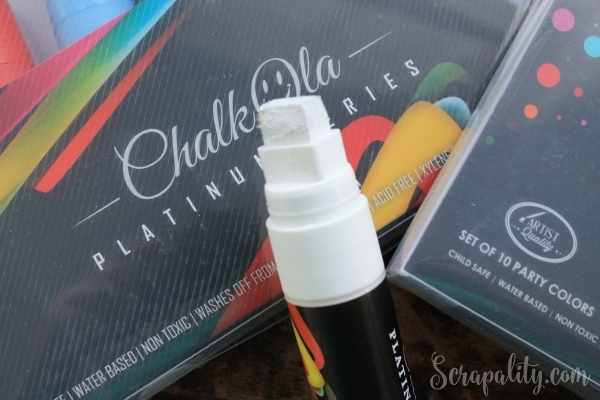 Why I love ChalkOla Wet Wipe Markers? If you would like to purchase your own set of ChalkOla Wet Wipe Markers click on one of the links below to purchase your set from Amazon. Plus, just for this holiday season you can save 20% Off on Amazon by using the code CHK20OFF. Follow ChalkOla on Instagram and Like them on Facebook. Let’s be thankful this month. I’m thankful that you stopped by today! I’m sharing this post with a few of my favorite parties this week. I don’t think I would have ever thought to do this, but it turned out so well! Found your post on Think Tank today. Thanks for stopping by! Hope you visit again sometime. 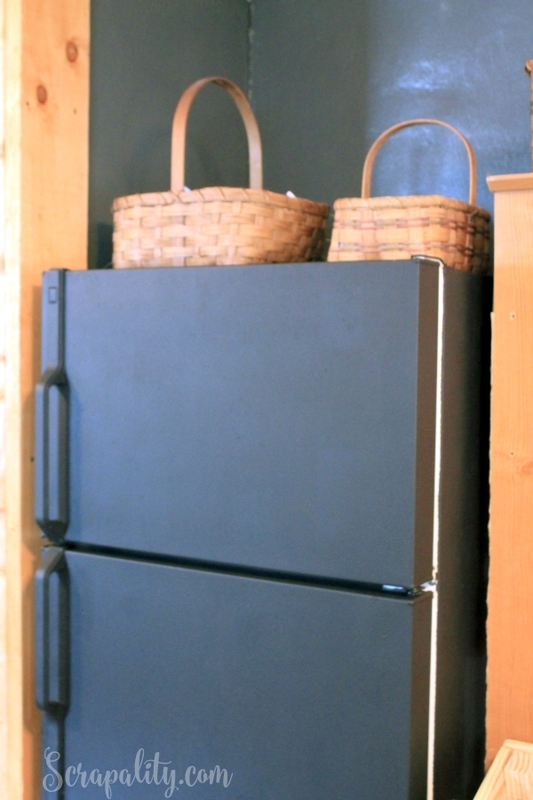 I love the idea of adding chalk paint to the fridge – so fun! It’s super easy to do. Thanks for stopping by. This looks great. I just finished a wall with blackboard paint. I don’t know if I could be brave enough to do the fridge. We need to have our black in doses. I love chalkboard walls too. I agree, we need the black. Love it Andrea! I haven’t seen those chalk markers before–will have to give them a try! Thanks so much for sharing @Vintage Charm! I’m really into chalk paint lately and while I wont’ be painting our fridge, look forward to using these products to make other interesting creations! Awesome! The markers are a lot of fun. I can’t wait to use them on a few other projects. Hope you stop back soon. I’ve never seen chalk markers before, but they are really cool! I have a friend who has a chalkboard paint fridge and it’s a lot of fun. The non-messy part wins my vote. I agree the chalk paint refrigerators are a lot of fun! Thanks for stopping by. I love this thrifty idea to update and revamp an old fridge, and those markers are perfect for fridge use as your design can stand up to heavy hand traffic from the kiddos. I will have to give these a try for sure! visiting from Your Gonna Love It, p.s. 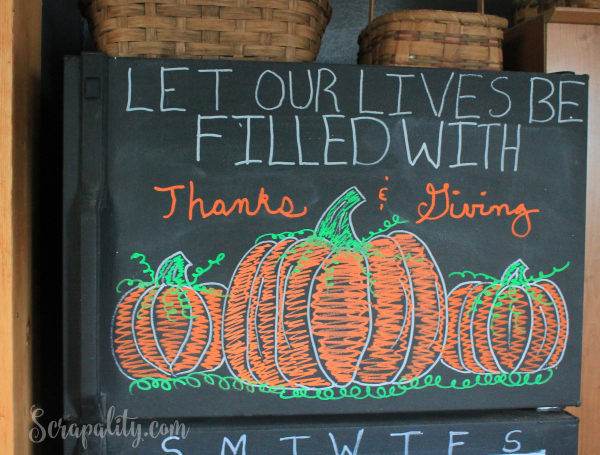 I posted a thanksgiving chalk board as well in the Tuesdays Favorite Finds Link. Thank you, Brenda! The markers are fantastic. They’re so much fun and so vibrant! Thanks for stopping by. This is pretty awesome! I have the same issue at my house. 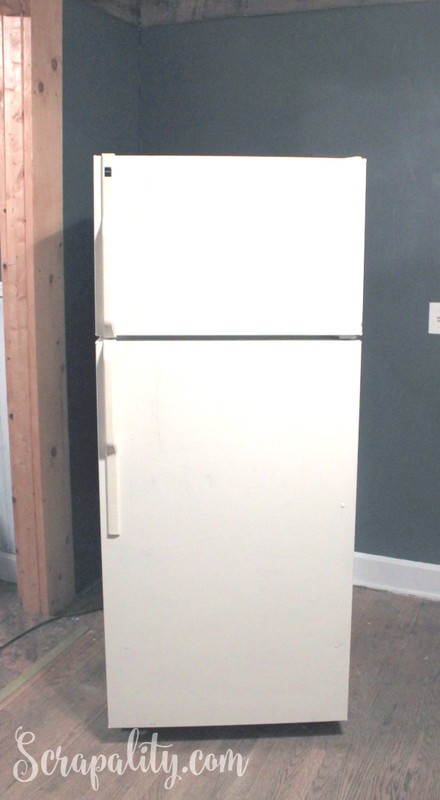 I have replaced all of my appliances over the past year other than the white refrigerator because it works so well . . . I’d so love to try this . . if only Mr. Hobby would agree. Thank you so much for sharing your project with us for Brag About It! My husband just rolled his eyes when I mentioned the idea to him. But, in the end he thought it was pretty cool. Thanks for stopping by. What a fun idea!! THe kids would love it! The kids love the refrigerator and the markers. It’s a lot of fun. Thanks for stopping by, Sherry. Such a great and thrifty idea! And I love how festive your fridge looks! :0) Thanks for sharing with us at the Merry Monday Link Party. Hope to see you again on Sunday! Thanks, Tiffany. I can’t wait to decorate the refrigerator for Christmas. I enjoyed the party. Thanks for stopping by. Great job! I feel like doing this to my stainless because of all the hand prints! My husband would kill me! Stopping by to let you know you are being featured on tomorrows P3 Party post! Have a great weekend! Thanks for pinning! Thanks, Kim! I’ll be by to check it out. Thanks for stopping by. Thank you! I look forward to the party every week. 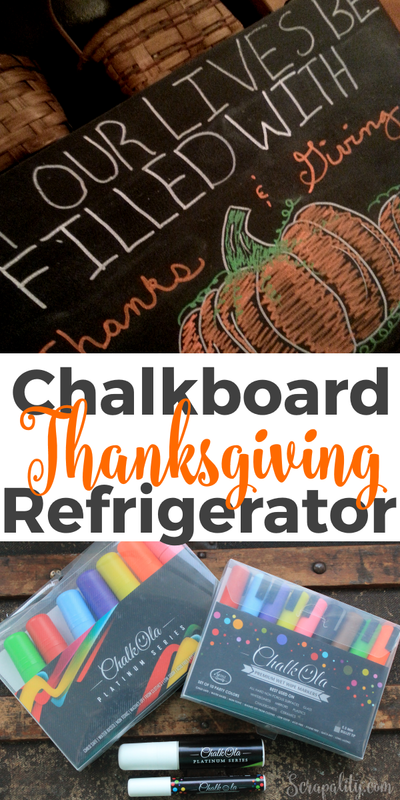 I love what you did with the chalkboard markers on your fridge, such a neat idea! Coming over from Home Matters linky party. I have a very basic fridge, manila color with the typical basic texture on its surface. I was going to follow the tutorials I’ve been reading to sand => magnetic prime coat => chalkboard coat the door. I have regular chalk to write with, but I also bought the chalk markers (not your brand specifically) which the box said to be used on non-porous surfaces. This was new to me and was concerned about using these markers on my type of fridge. I’m guessing with the layers of primer and chalkboard paint, I figure it will be smooth enough. I also have foam rollers, will that make a smooth non-textured layer?